According to Stat Counter, our views have jumped dramatically, so I want to take a minute to say "hi" and "welcome" to our little piece of the blogosphere. I thought a little of our history and an orientation to our site might be helpful to new followers and lurkers. 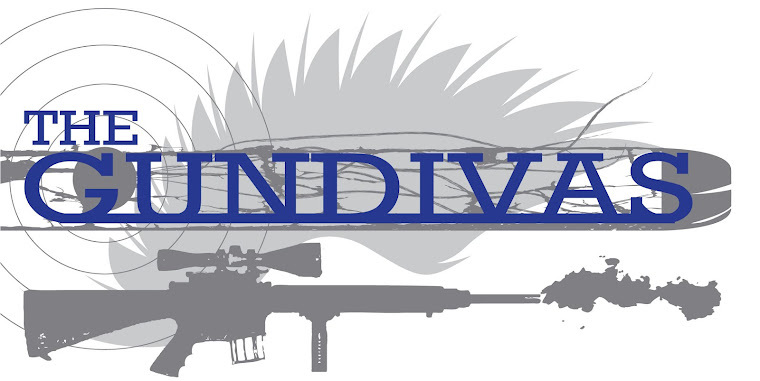 The GunDivas started life as "Girls With Guns" back in April 2010, a joint venture between Mrs Mom and me. Two female gun nuts who found each other through the interwebs (actually through our respective horse blogs). Tara joined our ranks shortly thereafter. The whole point of the blog was to share our little bit of knowledge and experience with other female shooters - we knew there had to be more than just a few of us. Our bios are at the top of the screen - just click the tab for each of us to learn more about us individually. Last January, GWG became The GunDivas when I wanted to buy the domain name for GWG and found out that not only had the domain name been purchased, but that it's essentially a T&A site. Yikes. All I can say is no wonder Tara and I got so much attention at SHOT Show last year when we told them which site we wrote for. Yeah, wrong site. Color me embarrassed. Now, Country Tea runs her own Girls With Guns blog, which looks like she started last November and I've pretty much read the whole thing, which is well-written and doesn't have a single T&A mention. You should go check her out. I've added a column to the right (lower part of the page), labeled "Fellow GunDivas' Blogs". As I find new female shooters' blogs, I'll be adding them to the column so make it easy to see what other females are doing around the nation. Please feel free to recommend new blogs to add to the list, but be aware that we reserve the right to choose which blogs to link to. The word cloud (top right) lists our most common tags, though it's not an exhaustive list. To see all of the posts related to a tag, just click the tag and it'll bring up the posts for you to choose from. For example, when you click "Shooting Tips", you'll find posts on proper range attire, how to fit your pistol to your hand, proper grip, etc. If you click "Reviews", you'll get gun and parts reviews. I know Mrs Mom is currently working on a review of her 1911 after switching from a Glock. We're also on Facebook! I don't Tweet and have no clue as to how to do one, but it's something we'll be looking into in the future (I think). To find us on Facebook, just click the picture on the right. Again, WELCOME to our new followers and lurkers. Please feel free to leave comments or questions, we don't bite, and we love to get to know our readers. I do like Country Tea's blog too! Ooh! Ooh! I'm a lurker! I lurk on your regular blogs too. I read far more than I comment! Too bad it's not National De-Lurking Day, huh? PS Nice header! Good work, MM! Hey thanks for the welcome! Oh, wait, I'm not new. Or am I? Sometimes I think I am demented...or something. We don't bite? Since when?! I bite every chance I get!! OK OK-- all kidding aside, welcome to everyone who has joined our little corner of the fun zone! Happy shooting, and keep your shots center mass! Huh I was wondering why you switched but I understand - I would too!